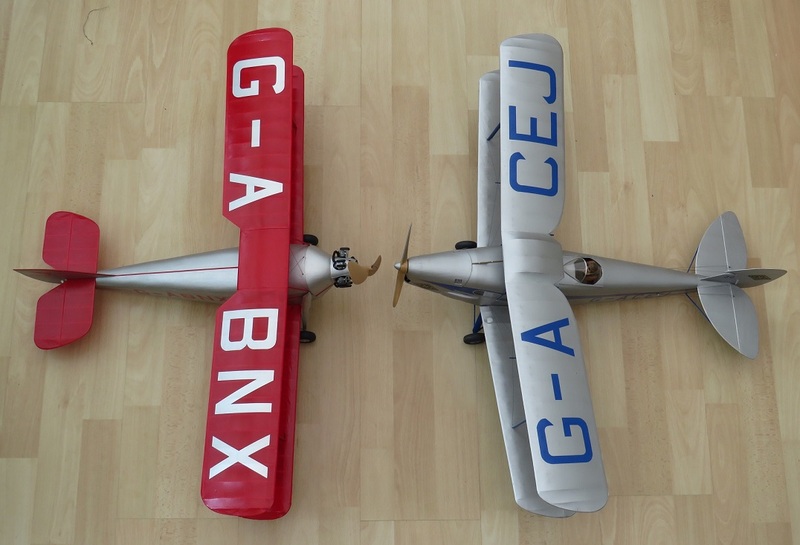 I built this model alongside the Achilles - it has an identical wingspan of 24" but is a more modern design, so made an interesting comparison. As you can see, it is basically a miniature Mercury Sirocco. 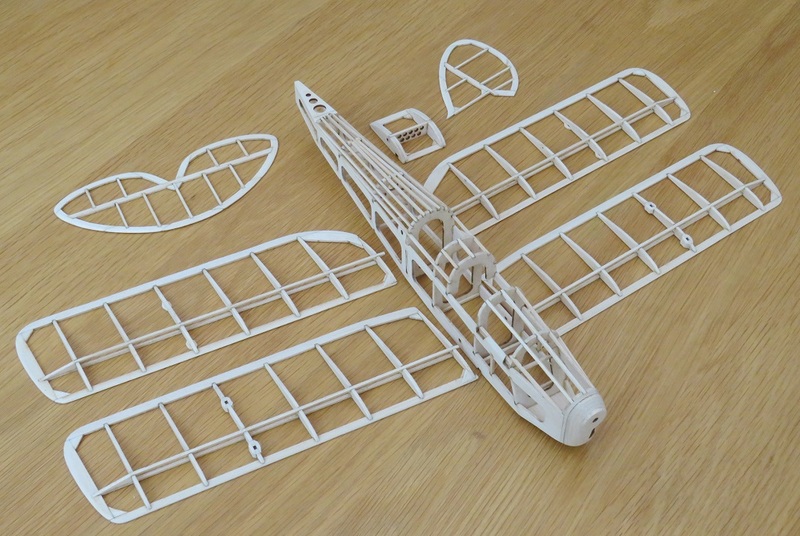 I used an old, partially started kit - the previous owner had obviously built the fuselage as all the bits for that were missing, but all the strip and die cut ribs were still there for the flying surfaces. Some of the strip wood was useable, but some was really horrible and hairy so needed replacing. I wasn't looking to optimise the performance so used the kit supplied prop and nose button. It could definitely handle a bigger prop if you wanted more duration. 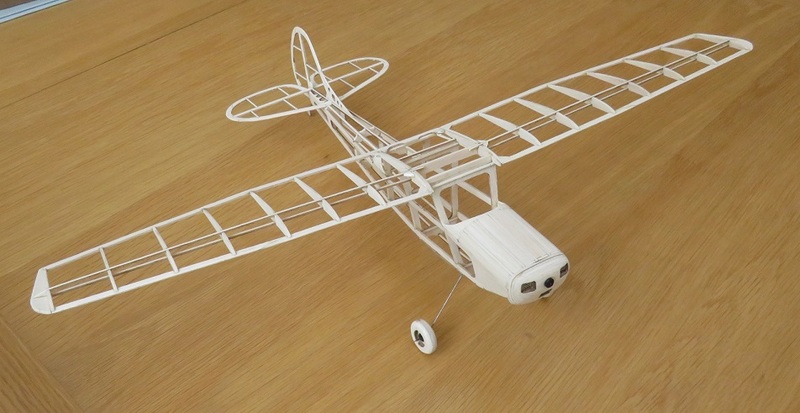 It was an easy model to build and trim and I'm sure a beginner to the hobby would have no problems putting it together and getting it to fly. 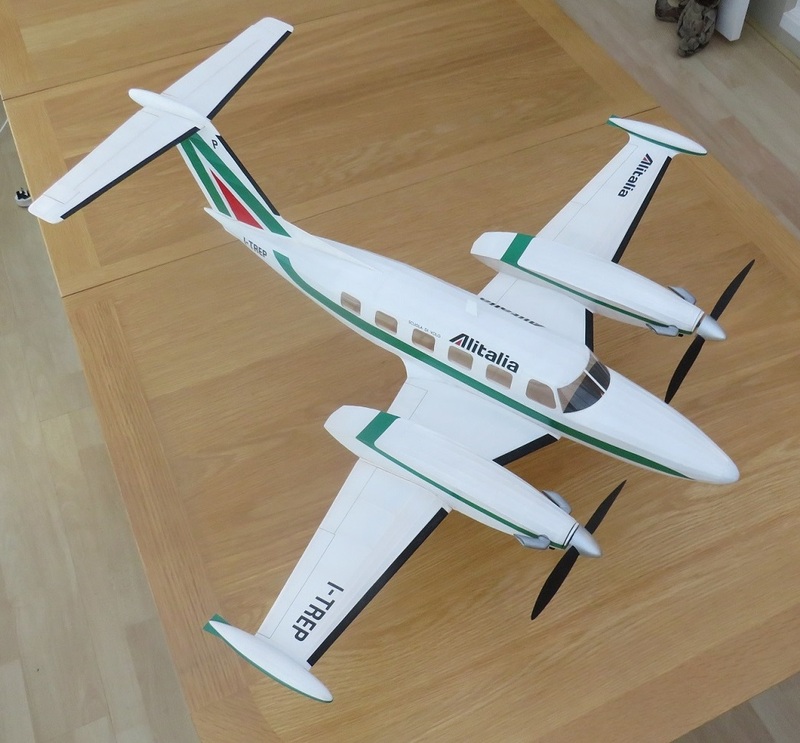 After getting the King Air to fly better than I had expected I was on the lookout for a similar modern twin with widely spaced long engine nacelles so I could take a new model to Geneseo in 2018. 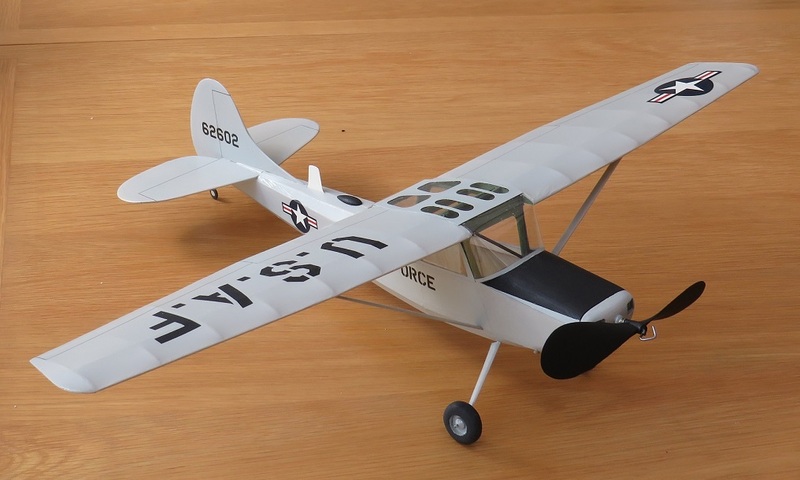 I decided to go for the Piper Cheyenne III, which has nacelles so far from the fuselage that it wouldn't even be necessary to cheat and move them out at all - I could swing 8 inch props on a 32 inch span model. 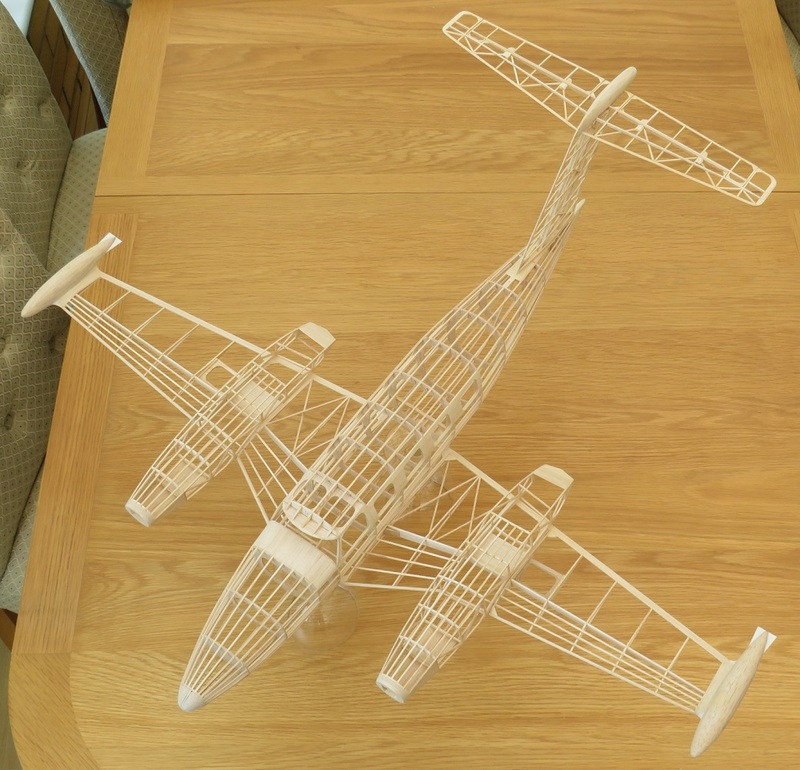 The size of the model was governed by the tailplane span having to be less than the width of my model box. 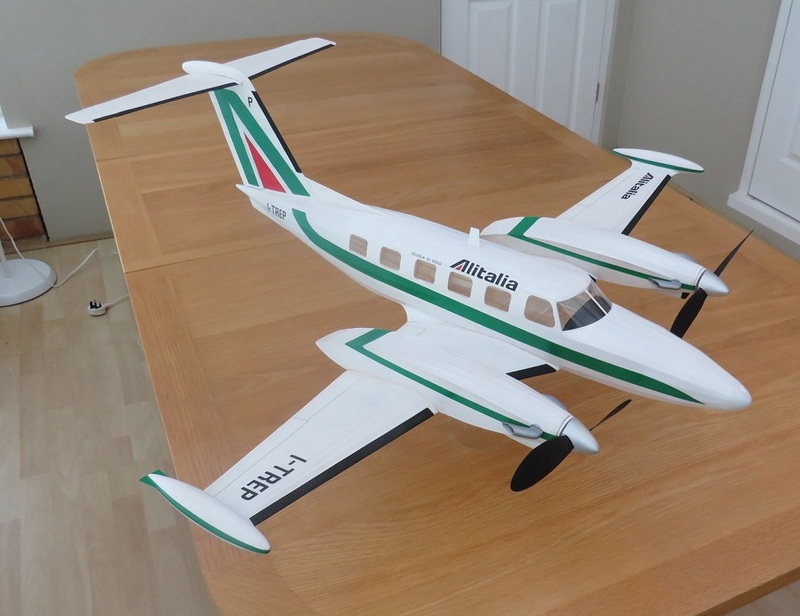 Another attraction was that I could do a full airline colour scheme on it as Alitalia used them for pilot training. 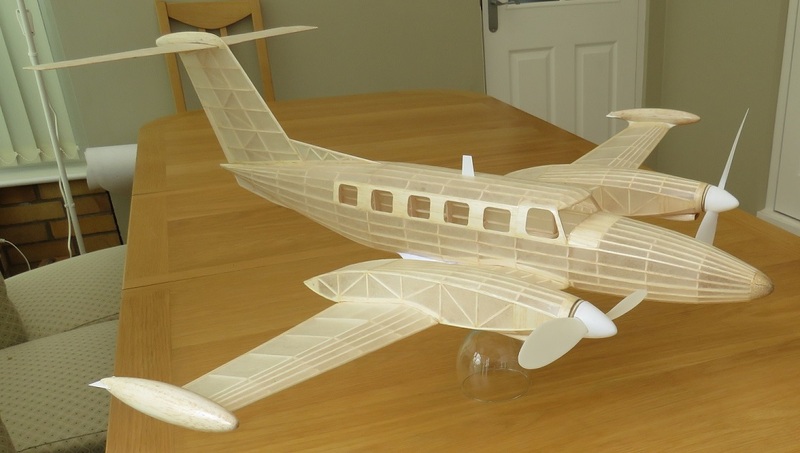 Structure is similar to the King Air - almost all 1/16" balsa. As you can see above I used a cracked rib wing with a single spar. The tip tanks are carved from soft blasa, then cut in half, hollowed out with a Dremel as thin as I dared, then the halves glued back together. 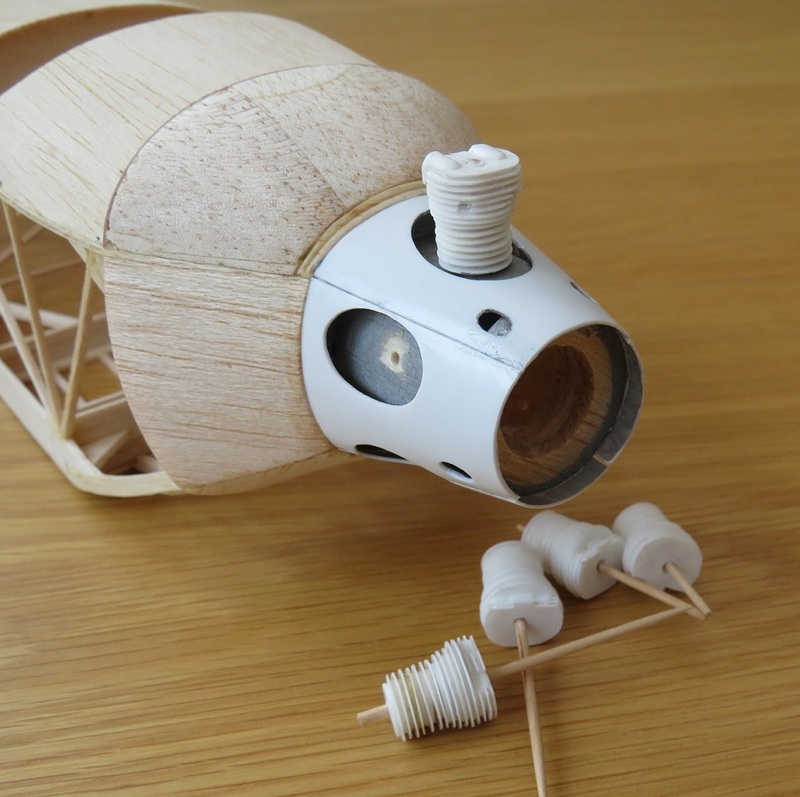 The outer wing panels are removable outboard of the nacelles, using tongues and boxes. The model is covered in white Esaki tissue and given just one thinned coat of non shrink dope. All the glazing was added after painting. Props are Easy Built 8" plastic items with the blades scraped thinner and the spinners are plunge moulded from 30 thou plastic card. 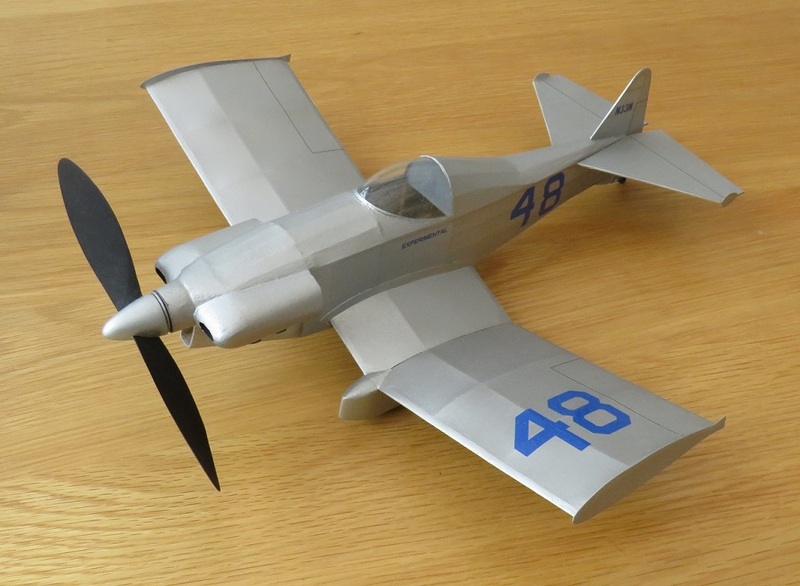 I wish I could tell you that the model flew off the board, but unfortunately it has proved extremely tricky to trim. Best I have managed so far is a 20 second cruise at just above head height circling right, but then the next flight it went left, and the one after that straight on leading to a mushy stall. I will persevere though to see if I can crack the problem as I think it's a great looking plane. I'm wondering if that huge fin is the problem? Not much I can do if it is other than build a new one slightly smaller than scale. As I'm limited in how many models I can take over to Geneseo in my model box, It's good to have one or two which can be entered in more than one event. Hence the decision to build a Goodyear racer which is eligible for both the mass launch event and peanut scale. These models tend to have masses of wing area for a peanut and can fly really well. There are plenty of plans out there, but I decided to plow my own furrow and draw up one that doesn't seem to have been modelled before. I'm Grateful to Rich Weber for providing me with documentation for a few possibilities, of which I chose this rather distinctive little Racer - the Northrop Special, built by Russ Northrup in 1952. It has a quirky appeal with its inverted gull wing and wheel spats. 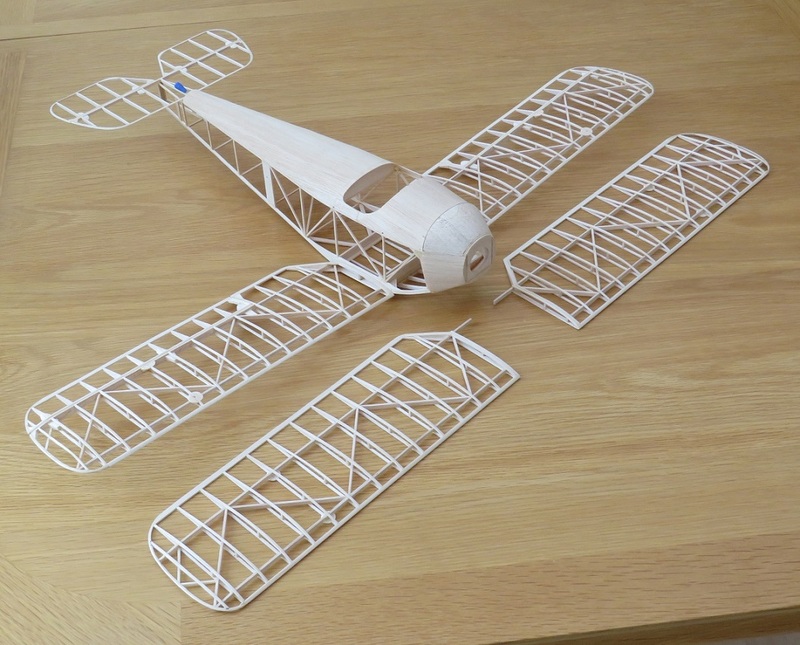 Structure is a mixture of 1/16" and 1/20th balsa - the fuselage box is 1/16", thicker than I'd usually use for a peanut, with the formers and stringers in 1/20th. The small wheels inside the wheel spats are fixed, and there is no wire in the undercarriage, which helps to keep it light. Covering is white Esaki, pre-shrunk on a frame for the tail surfaces and airbrushed with Xtracolour RAF High Speed Silver enamel. 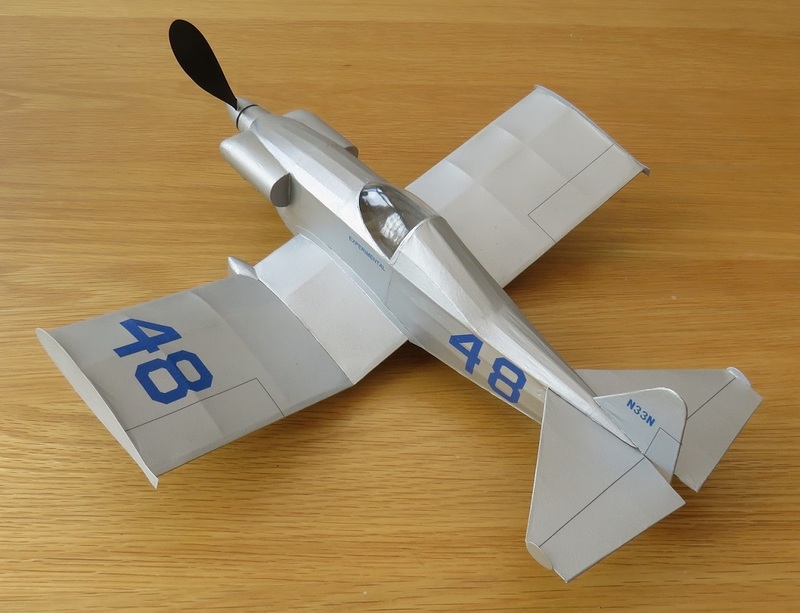 I used 10 thou plastic card for the wng and tailplane end plates - a first for me on a flying model. 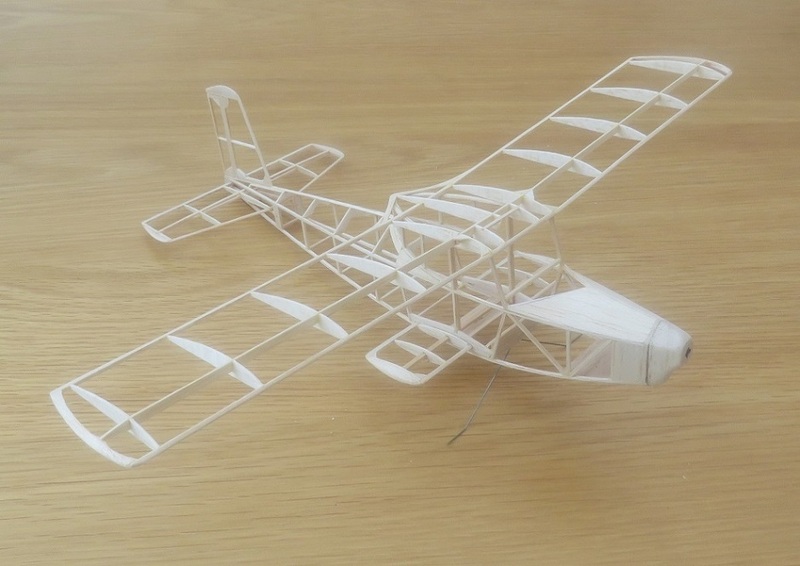 I thought they would be much more likely to survive wingtip arrivals than thin balsa. Normally on a peanut scale model I would use a 5 inch prop, but the standard set up for these Goodyear racers seems to be 6 inch , so I fitted an Ikara example, but scraped as thin as I dared to stop the model being nose-heavy. Initial test hops showed the model was slightly nose-heavy, so I shimmed the tailplane to give a touch of negative incidence, which sorted the problem. Somewhat to my surprise the combination of a loop of 1/18" rubber and the 6" high pitched prop worked really well - the wide chord wings must be the reason for this. At the 2018 FAC Nats I was getting times around 50 seconds without thermal assistance - thanks to Clive Gamble for the "proof of flight" photo! 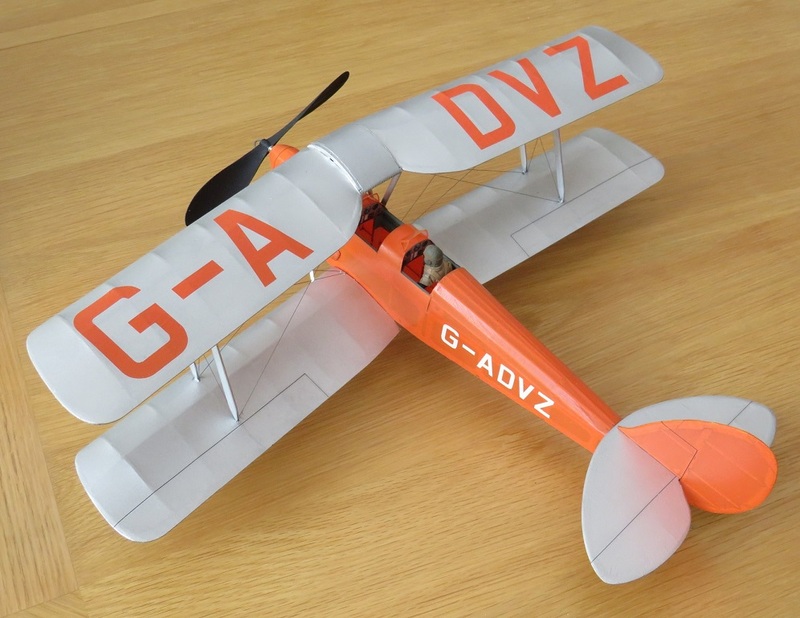 With the Fox Moth turning out to be such a good indoor flyer, I decided to copy Dave Rees's design methods and build an identically sized biplane for my next open rubber model. The choice of the Robinson Redwing was down to the fact that I liked how it looked, it was well documented, the colour scheme with red wings and silver registrations is attractive and not too difficult to reproduce. Also, as far as I knew nobody has modelled it before, at least at this size. Span is 29 inches and I was aiming for an all-up weight of 100 grams. 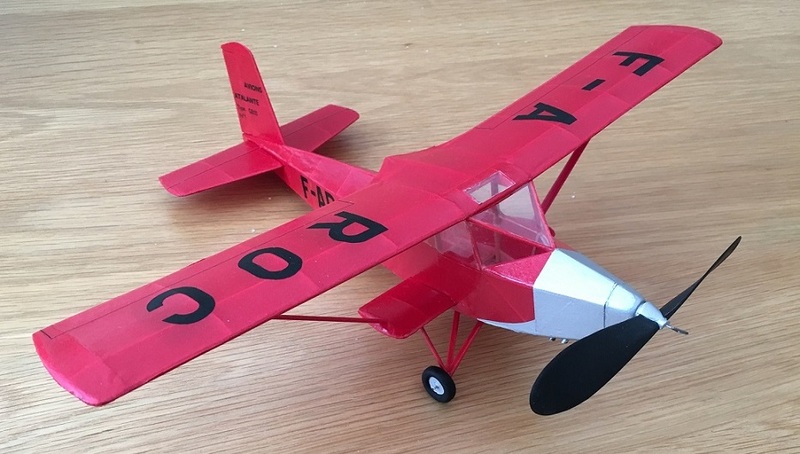 The nose is shorter than the Fox Moth, but I thought the scratch built engine should add a fair proportion of the nose weight that would inevitably have to be added. The weight of the components at this stage was 26 grams. The fuselage structure is mainly 1/16" square, but I have doubled up the lower longerons. The upper decking is very soft 1 mm balsa. Wings are classic Dave Rees structure - see article here for details. The Genet engine cylinders were constructed by laminating discs of plastic card together, threaded onto cocktail sticks. The lowest discs are circular, so easy to cut out with a compass cutter, but higher up the shapes get more complicated, and had to be plotted individually using CAD. I didn't want the finished cylinders to look as if they were just stuck onto the oputside of the nose, because on the original they clearly protude through oval holes in the cowling panels. Thus the cylinders were mounted on a dummy crank case and the four cowling panels were plunge moulded from plastic card. The exhaust was made from "Hearty clay", a lightweight air drying modelling clay produced in Japan. lengths were rolled out and curved round templates of different radius while they dried. These were then cut to length and assembled. It's nice stuff to work with and tougher than other brands of clay I have tried. As far as I know there is no UK stockist, so I obtained mine from a supplier in the USA. I'm told if you keep it in an airtight container it will keep for ages. The model was airbrushed with enamels and the markings cut from painted waterslide decal film apart from the Redwing logo on the fin which is a home made laser printed decal. Rigging is fishing nylon and so functional. For the first time I inserted small fuse wire loops into the wings next to the struts to pass the rigging wires through, before looping through short lengths of plastic tubing to represent the turnbuckles. A small drop of thin cyano into the tubing secures the wire. The full size aircraft has red rigging wires, so mine were brush painted with thinned enamel after installation. 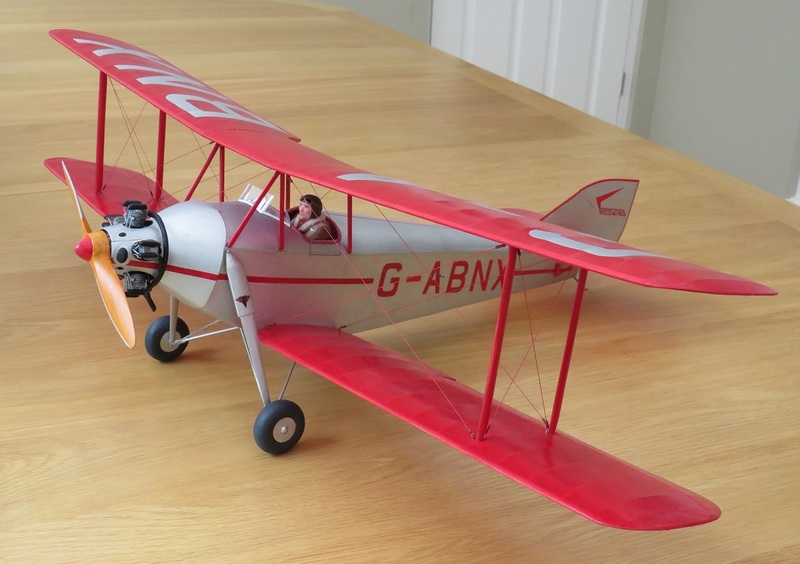 Here is the finished model nose to nose with the Fox Moth - both have identical wingspan and very similar wing area. 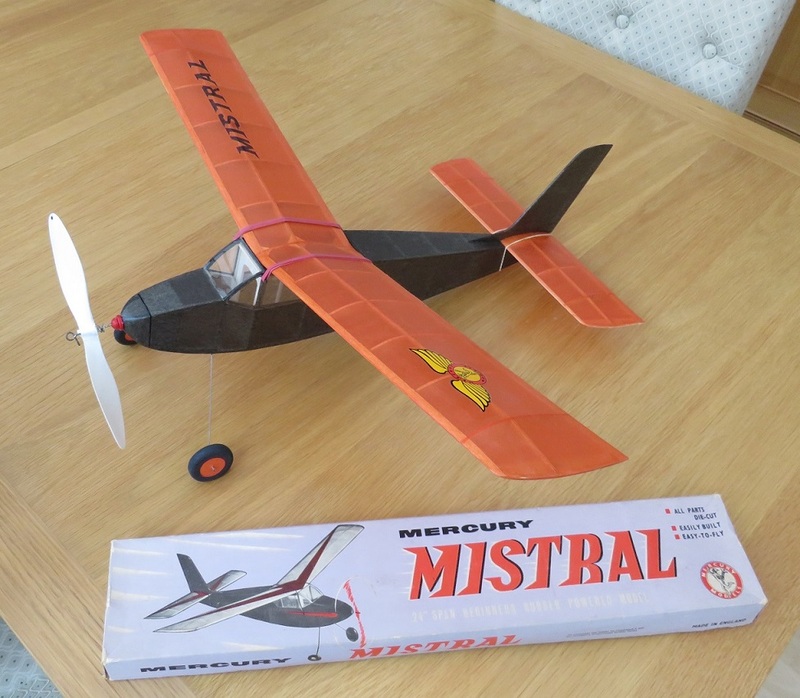 The Redwing uses the same Easy Built 10" plastic prop as the Fox Moth for flying, but I had to cut it down by half an inch to allow take-offs and landings without the prop clattering the ground. 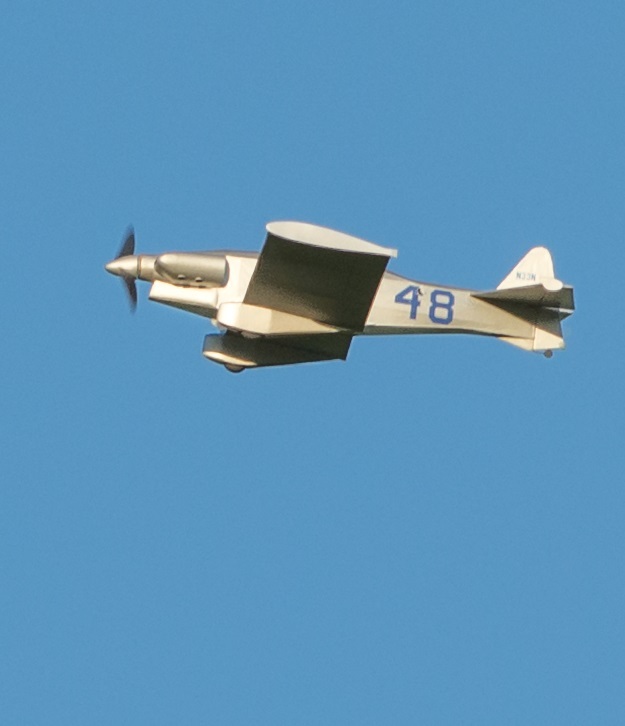 The model was trimmed during the International Indoor Fly In at Nijmegen in 2018. 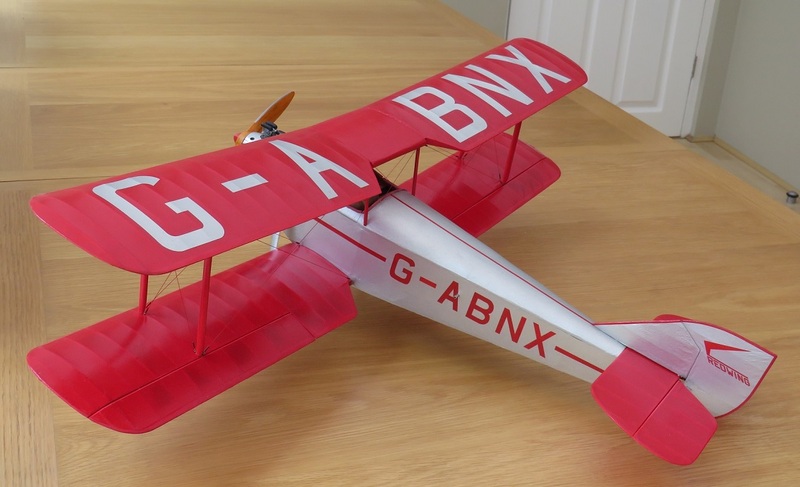 It needed 4 grams of nose weight to stop it stalling, which with two loops of 3/16" rubber on board brought the all-up weight to 97 grams - exactly the same weight as the Fox Moth. Not surprisingly it flies just as slowly. It needed a fair amount of left rudder to get a safe circuit in the sports hall, and then some down left aileron and up right aileron to keep the wings level. As you can see in the video below I think I still need a bit more downthrust to control the slight stall after take-off. Still, I was very happy with the way it went first time out. Having ripped the wings of my Blackburn Shark at the 2018 Oxford Scale meeting, I suddenly had the need for a new kit scale model to enter at Nijmegen in a few weeks time. 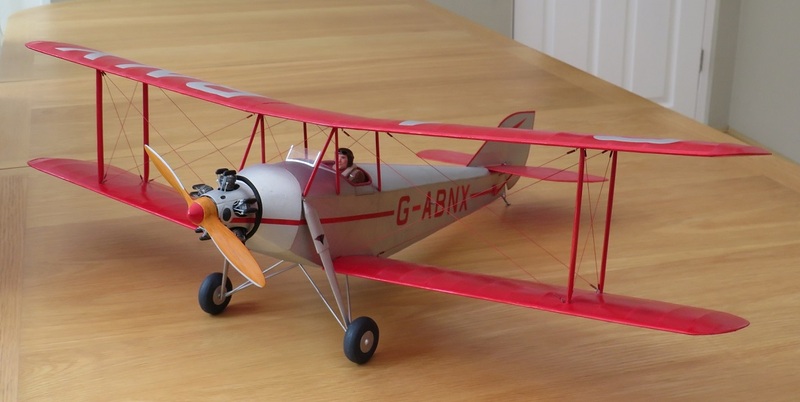 So I ordered the latest release by the Vintage Model Company, a very nice 21 inch span Cessna Bird Dog. Postage is free, and the kit arrived in a couple of days. Just 17 days later I had an attractive new model ready to fly. The kit was great - everything fitted perfectly - the laser cutting was a real time saver. I didn't change anything on the design except filling in between stringers with soft balsa in front of the windshield and replacing the paper patterns for the window frames and the panel above the wing centre section with 10 thou plastic card. Two reasons for this � firstly with an airbrushed finish, plastic card gives a smoother finish than paper and secondly I wanted to attach the glazing with Formula 560 canopy glue, and this water-based adhesive would have caused local swelling of the paper. The airbrushed finish will lose me a few points in static judging, but I think looks better than coloured tissue. Markings are home-made decals apart from the large U.S. ARMY titles on the wing which are cut from black painted decal sheet and applied in sections. I couldn't resist adding a few extra details to add more character, so the avionics hump and aerial behind the cabin, some extra struts inside the cabin and the exhausts under the cowl. Weight was 28 grams without rubber, which went up to 35 grams with rubber and after adding noseweight. The model proved very easy to trim out in the hall at Nijmegen - basically I just added noseweight until the gentle stalling stopped. I added a rudder trim tab bent left and a bit of right thrust, plus a couple of Gurney strips under the left wing to stop it dropping. Even with the low dihedral, the model is rock steady. Proof of flight video is below. I think this kit would make a good first scale model for a beginner to the hobby - highly recommended! This is another Vintage Model Company kit, one of their "Magnificent Flying Machines" range and not the old Veron kit. I had started it in 2017 only for construction to grind to a halt due to competition deadlines for other models. However, I'd enjoyed building the VMC Bird Dog so much, I did a speed build to get it finished in time to take to Nijmegen so I could trim it out in a large hall. I thought it would also be a nice to have a reserve kit scale model with me. Kit structure shown above is fairly sturdy, but not too heavy due to the excellent wood selection in the kit. 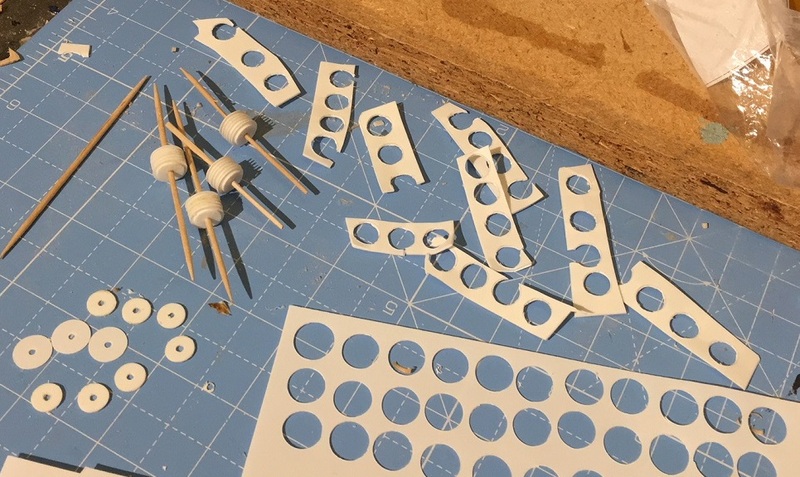 A modification I made to the kit design was to not use the paper pattern for the top nose decking, but fill between the stringers with soft balsa and then sand smooth. Another minor modification was to add a balsa former just inside the rear edge of the paper side cowls to stop them getting squashed every time I picked it up round the nose. As on the Bird Dog, fit of parts was excellent. 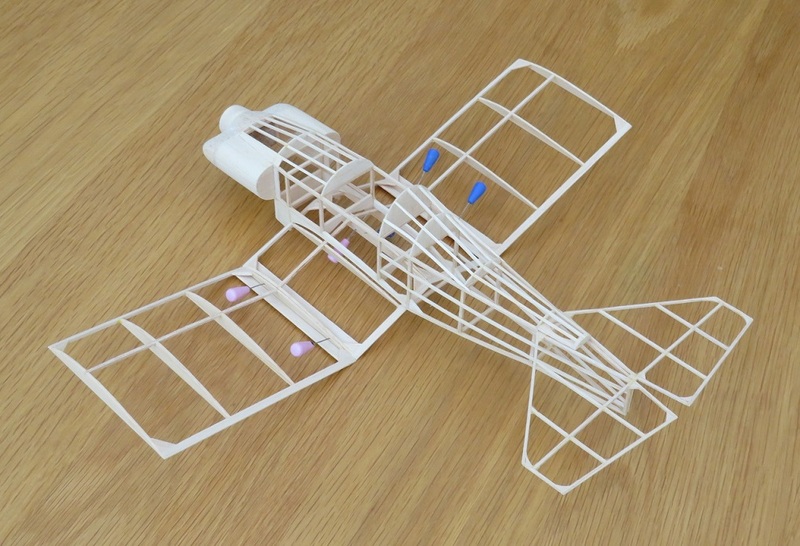 The fitting of the wings was also straightforward due to the comprehensive instructions and supplied wing jigs. Finishing touches were a Dave Banks pilot in the rear seat and wing rigging from fishing nylon. All up weight came out at 37 grams, including nose weight and a loop of 3/16" rubber. 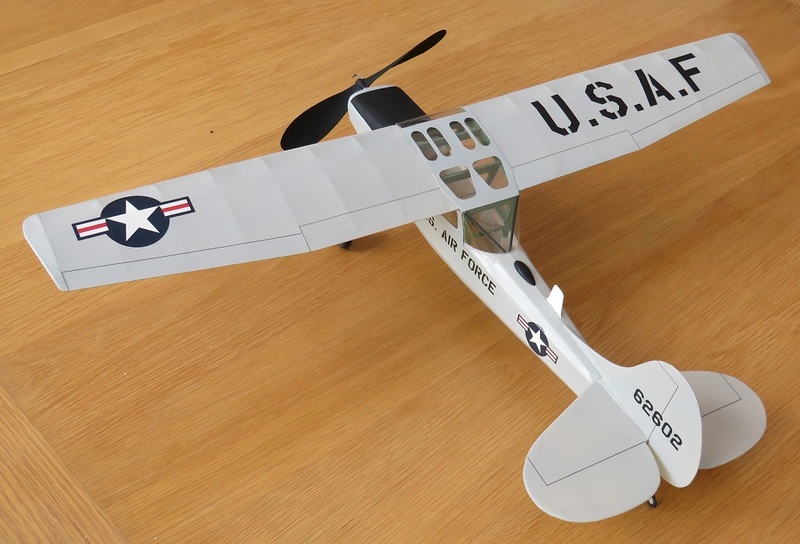 This may sound a lot, but the model has plenty of wing area and it flies fairly slowly. It did need quite a lot of noseweight and trimming consisted of adding more and more until it stopped stalling. I was then rewarded with a nice take-off and gentle left hand circuits. To stop it straightening quite so much in the glide I added a rudder trim tab bent left and additional right side thrust. Sometimes I think you just have to build a model for fun without worrying about references and documentation. I was looking for a peanut to buiild to fly at our monthly indoor meetings in Newbury and found myself looking through Emmanuel Fillon's extensive collection of peanut designs. 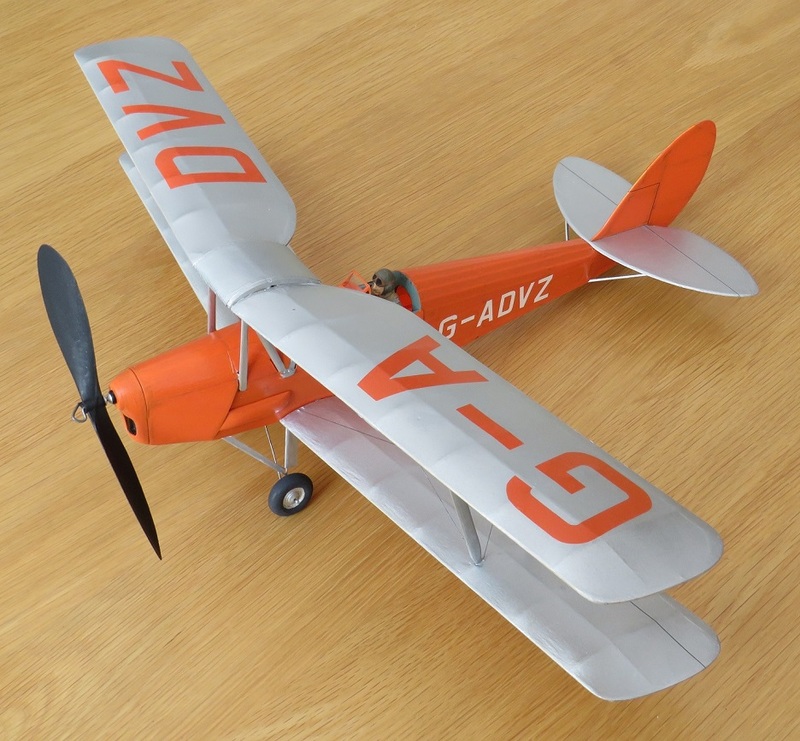 He did plans for so many quirky, obscure French light aircraft that I was spoiled for choice, but eventually decided on this Atalante GB 10. I love the rear cabin window treatment and the tiny lower wings, plus it's got a nice long nose and a relatively simple colour scheme. The plan calls for the use of a lot of 1 mm square balsa, but I can't handle sticks that small, so used 1/20" square instead. I hinged the rudder but didn't add separate elevators and elevators. Finish was gloss red enamel over red Esaki tissue. Wing markings were cut from painted decal sheet and fuselage and fin markings were laser printed decals. Final weight without rubber was 10 grams. Initial trimming showed that the model was basically stable, but nose heavy, so I had to add tail weight. It was also overpowered with a loop of 3/32" Tan Super Sport rubber and got up into the ceiling structure too quickly. As soon as I got it home I gave the prop a good scraping, removing enough material to hopefully allow the tail weight to be removed.